Telzio enables you to set up a customer support line that can handle high-volume calls, hunt groups, and remote teams. You can customize waiting times, routing preferences, hold music, and much more. In this article, you’ll learn how to set up a customer support line. Telzio is an internet-based phone service, which means all you need is internet connectivity to use our mobile app, an IP phone, or a softphone. You can direct multiple phone numbers to the same customer support line, enabling you to provide local and toll free numbers to your customers that all route to the same place. You can use your Telzio service in any location, making it easy for remote staff to work from anywhere. There is no limit to the number of callers you can have waiting on a single customer support line. Before you can set up a customer support line, you’ll need a phone number and users. Learn how to Get a Phone Number. Learn how to Create Users. 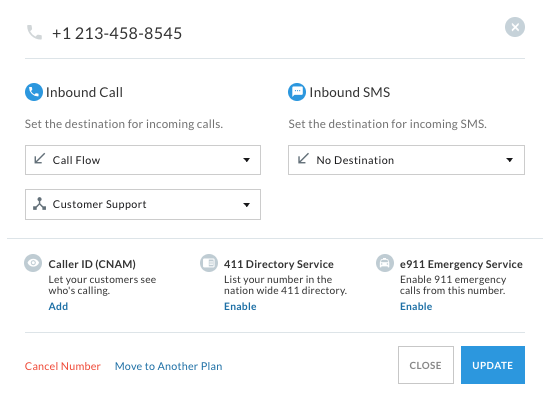 A Call Flow refers to the arrangement of features you can add to automate your inbound calls. Learn more about Call Flows. Actions are the features that make up your Call Flow, such as Phone Menus, Opening Hours, and Voicemail. A Queue places callers on hold until the next agent is available. Follow these steps to learn how to set up a customer support line. Once you have a phone number and users on your Telzio account, you can start by adding a new Call Flow. This way, you can identify it later when you have multiple Call Flows. Give your Call Flow an extension. 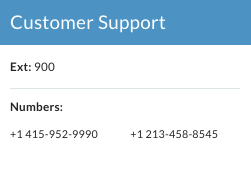 You can transfer callers to this extension to send them to the customer support line queue. The key feature we’ll be using to set up a customer support line is the Queue. Queues enable you to handle high-volume calls by keeping callers in a virtual line until the next person is available to answer the call. 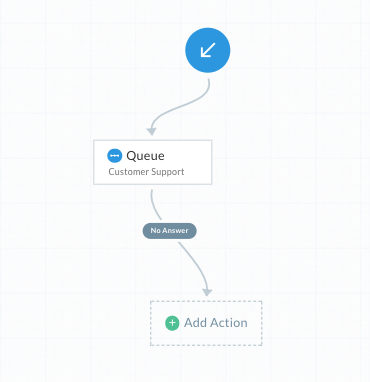 Click Add Action in your new customer support Call Flow. Click Queue and you’ll see a new window appear where you can edit your Queue preferences. This will be helpful if you have agents handling multiple different lines. You can enable announcements for your agents, so they know which line the caller has dialed before they answer. Mark the Call Settings you’d like to enable for the Queue. Record all incoming calls to the customer support line. Offer callers a callback when there are more than 2 callers in line. Announces the caller’s place in line to the caller. Announces the length of time the caller has been waiting to the agent. Announces the Queue name to the agent when they answer. Calls all your agents in the list at the same time. Calls your agents in order listed. Select the type of Hold Music you want callers to hear. 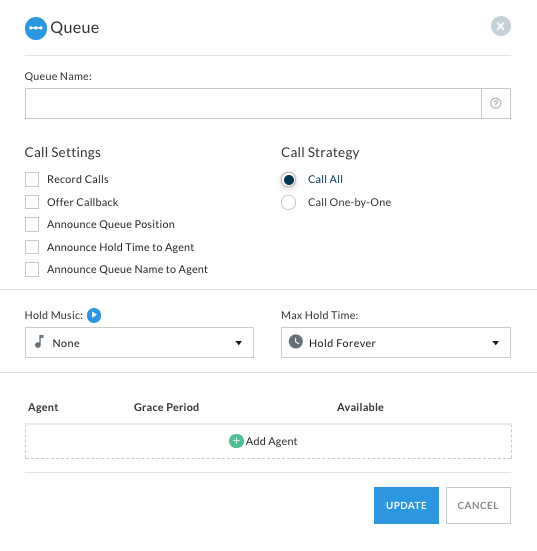 Select the Max Hold Time you want callers to hold on the line until re-directing them to a different Action. This keeps your callers from waiting for too long. *The recommended Max Hold Time is 5-10 minutes. Add Agents to answer the customer support line. Select the User you want to add to this customer support line. Select the length of time before the next call is sent to the agent. This gives your agents time to wrap up notes from a previous call before taking another caller. Mark the box if you want this agent active on the support line. * Agents can sign in and out of Queues by dialing *1, and through their User Dashboard. Click Update when you’re done setting your preferences. When your caller reaches the Max Hold Time, they will be directed to the next Action in your Call Flow. In this example, we’ll route these callers to a Voicemail. You can choose to send them to any of the Actions available. After you’ve saved your Queue, click Add Action. Click Voicemail, and a new window will appear where you can edit Voicemail settings. Press the play button to hear the default greeting. You can upload or record a new greeting directly through your browser. 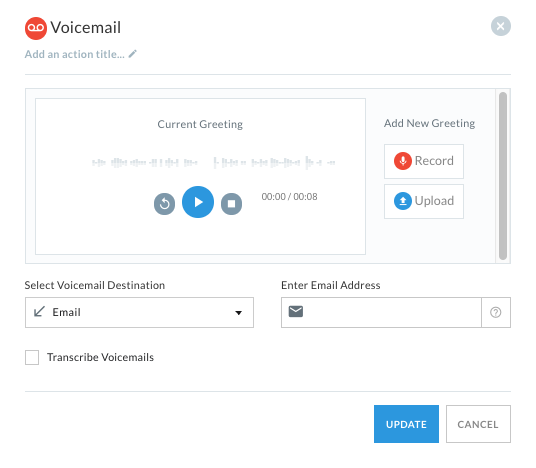 Select a Voicemail Destination, where you want to send Voicemail messages. Send Voicemail to a single User. Send Voicemails to a Group of Users. Send Voicemails to an Email. Once you have your Call Flow all set up, you’ll want to direct your phone number(s) to it, so when people call, they reach the Call Flow. You can point multiple numbers to the same Call Flow. Navigate to Plans & Numbers. Click on the Plan that includes your phone number. Click on the phone number to open its settings. Under Inbound Call, select Call Flow. 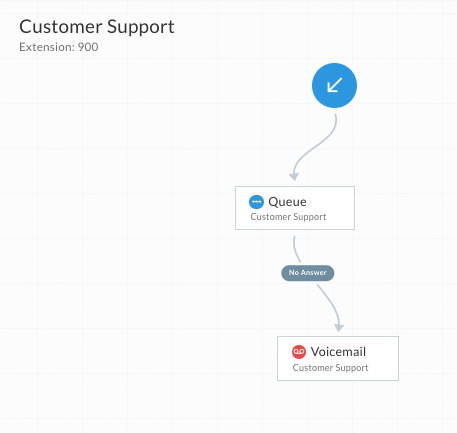 Click the Call Flow that you created for your customer support line. Now when you go back to your Call Flows, you’ll see your phone numbers attached to the Flow.